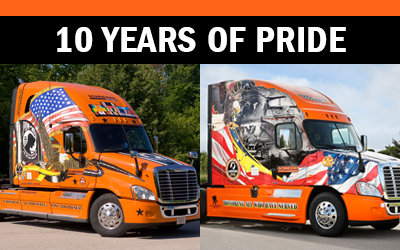 Schneider has been selected by Freightliner to receive 11 Ride of Pride trucks through the years, a special fleet of trucks designed to be rolling tributes to members of the military, captained by an elite team of Schneider drivers with military experience. 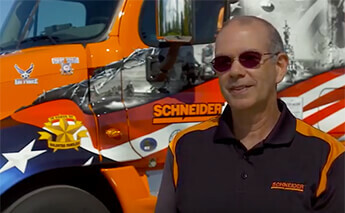 Learn more about Schneider’s Ride of Pride program, what it means to veterans and how you can follow along. 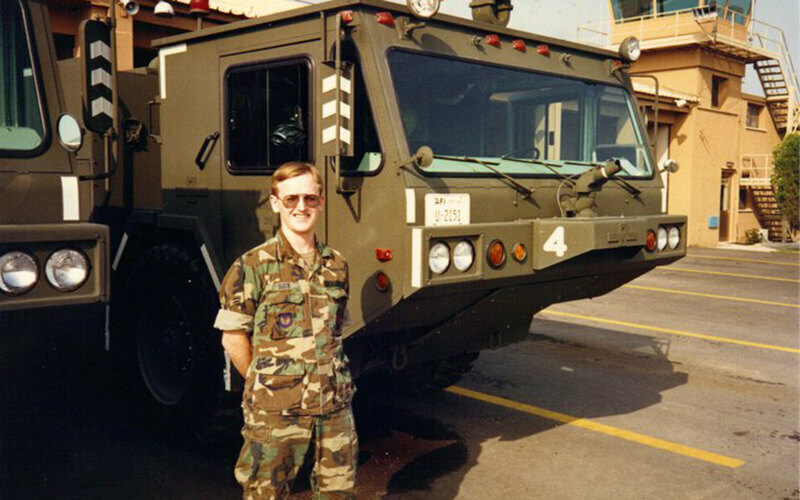 The Ride of Pride originated in 2001, when Ed Keeter, a shift manager and U.S. veteran at Freightliner’s manufacturing plant in Cleveland, N.C., proposed the project as a way to honor military veterans. It quickly became part of a national effort that includes participating in major events like the annual Ride for Freedom (Rolling Thunder) and Wreaths Across America. 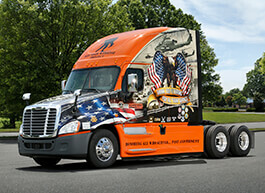 The 2017 U.S. Ride of Pride truck, a Freightliner Cascadia®, details memorials such as the Vietnam Memorial, World War II Memorial, Arlington Cemetery and 13 other monuments. 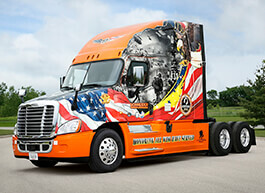 The 2016 U.S. Ride of Pride truck, a Freightliner Cascadia®, includes historical images representing all U.S. conflicts from World War II on, an American flag and bald eagle, and hood decals paying tribute to prisoners of war (POWs) and those missing in action (MIA). 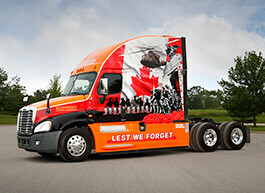 The 2015 Canadian Ride of Pride truck, a Freightliner Cascadia®, is decaled with imagery from the Canadian War Memorial in Ottawa, Ontario, as well as 10 gravestones from Flanders Fields in France. The Canadian flag and red poppies frame each side of the truck, along with the sayings “Lest We Forget,” and “Appuyons nos troupes” (French for “Support our troops”). 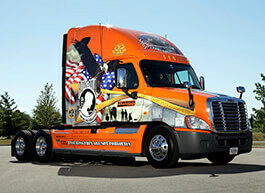 The 2014 Schneider Ride of Pride truck, a Freightliner Cascadia®, is decaled with historical images representing all U.S. conflicts since World War II. It also showcases Arlington cemetery and the digital camouflage military uniform. This Ride of Pride was the first in Schneider’s fleet to include logo decals of the Guard and Reserve segments of each branch alongside the logos for the active branches. 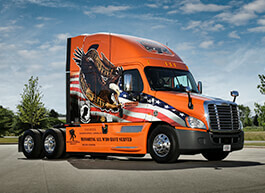 The 2013 Schneider Ride of Pride truck, a Freightliner Cascadia®, has a fully customized patriotic decal scheme, including the American flag, the bald eagle, military camouflage, the POW/MIA logo and the words “Those who serve deserve honor, respect, thanks” prominently displayed on the orange Schneider cab. The 2012 Ride of Pride was the 10th edition, Rolling Thunder, “Ride of Pride” Cascadia® tractor. 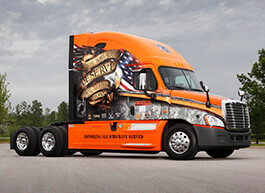 The truck is decaled with designs that honor Veterans, POW-MIA and other service members of the United States military – past and present. A large bald eagle looks menacingly from the tractor’s side with the words, “Home of the Free, Because of the Brave” written large around it. 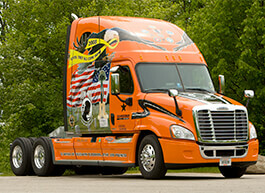 The 2011 U.S. Ride of Pride, a Freightliner Cascadia®, marked the 10th anniversary of 9/11. 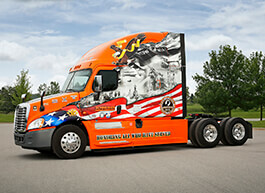 The fully customized truck features symbols of America and the armed forces, including an American flag, bald eagle and POW and MIA logos. The 2011 Canadian Ride of Pride truck was the first-ever Canadian Ride of Pride, featuring symbols of Canada’s armed forces. The words “Lest We Forget” and “We Support Our Troops” are written in English and French, recognizing the two official languages of Canada. 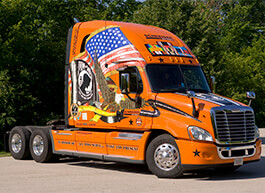 The 2008 Ride of Pride truck is a one-of-a-kind Freightliner Cascadia™, fully customized with symbols of the United States and the U.S. armed forces decaled on the orange Schneider cab. 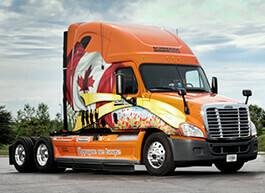 The Ride of Pride VI is a Freightliner Cascadia™, a truck model launched in May 2007. The design features images of a bald eagle, an American flag, a POW-MIA logo and military campaign ribbons from World War I to the Global War on Terror. 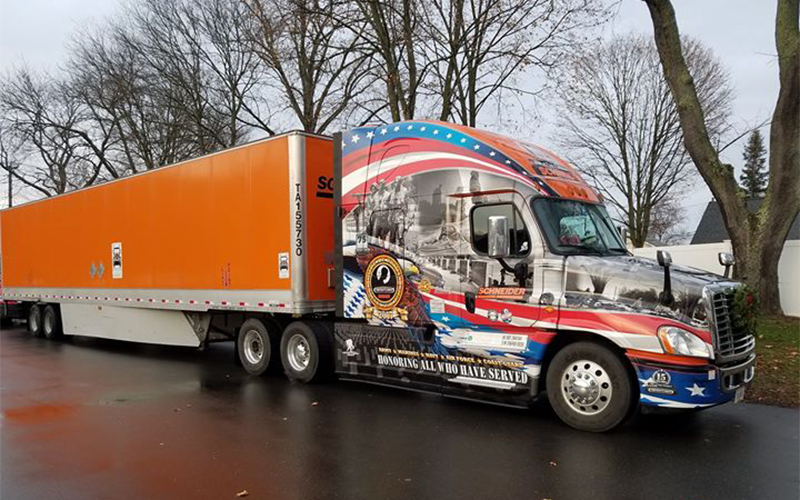 Schneider’s newest Ride of Pride truck travels the country, making appearances at military events, driver recruiting events and other special occasions. Past Ride of Pride trucks haul freight, but you’ll still see them out on the roads. To see any of the tractors up close throughout the year and interact with the newest driver, “like” us on Facebook. Get started with a military profile.